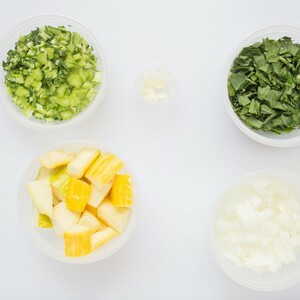 A typical chimichurri consists of parsley, garlic, vinegar, lemon or lime juice, olive or vegetable oil, and flakes of chili pepper. Pronounced "CHimi-CHoori," Known as Argentine barbecue sauce, chimichurri is thought to have its beginnings in Argentina, where it is commonly used as a marinade for grilled steak. However, this sauce is very versatile. Chimichurri can also be used to flavor fish, chicken, vegetables, or even pasta. It can even be used as a condiment to add extra flavor to traditional South American or Mexican dishes. Because parsley is the main ingredient, chimichurri is favored during Spring and Summer when this herb is abundant. The fresh ingredients give chimichurri an intense garden flavor and a vibrant green color. Chimichurri can be made in all sorts of varieties, based on the flavor profile you are seeking to add to your dish. In fact, the word chimichurri is thought to have derived from the Basque word "tximitxurri," loosely translated as "a mixtrue of several things in no particular order." Add cumin, thyme, or bay leaf to the sauce to make the flavor more robust and hearty. Or spice it up with the addition of jalapenos. In its red version, tomato and red bell pepper may also be added.